Researchers from the National Astronomical Observatory of Japan (NAOJ), the University of Tokyo and other institutions have begun a wide-area survey of the distribution of dark matter in the universe using Hyper Suprime-Cam, a new wide-field camera installed on the Subaru Telescope in Hawai'i. Initial results from observations covering an area of 2.3 square degrees on the sky toward the constellation Cancer revealed nine large concentrations of dark matter, each the mass of a galaxy cluster. Surveying how dark matter is distributed and how the distribution changes over time is essential to understanding the role of dark energy that controls the expansion of the universe. These first results demonstrate that astronomers now have the techniques and tools to understand dark energy. The next step is for the research team to expand the survey to cover a thousand square degrees on the sky, and thereby unravel the mystery of dark energy and the expansion of the universe. Mapping dark matter over a wide region is key to understanding the properties of dark energy, which controls the expansion of the universe. These early results demonstrate that with current research techniques and Hyper Suprime-Cam, the team is now ready to explore how the distribution of dark matter in the universe has changed over time, unravel the mystery of dark energy, and explore the universe?s expansion history with great detail. Hyper Suprime-Cam lead developer, Dr. Satoshi Miyazaki, from the National Astronomical Observatory of Japan?s Advanced Technology Center and leader of the research team, praised the ability of the HSC for this work. "Now we know we have the both a technique and a tool for understanding dark energy. We are ready to use Hyper Suprime-Cam to create a 1000 square degree dark matter map that will reveal the expansion history of the universe with precise detail." Ever since 1929, when astronomer Edwin Hubble discovered that the universe is expanding, astronomers used a working model that had the rate of expansion slowing down over time. Gravitational attraction, until recently the only known force acting between galaxies, works against expansion. However, in the 1990s, studies of distant supernovae showed that the universe is expanding faster today than it was in the past. This discovery required a dramatic shift in our understanding of physics: either there?s some kind of "dark energy" with a repulsive force that forces galaxies apart, or the physics of gravity needs some fundamental revision (Note 1). To unravel the mystery of the universe?s accelerating expansion, it is helpful to look at the relationship between the rate expansion of the universe and the rate at which astronomical objects form. For example, if the universe is expanding quickly, it will take longer for matter to coalesce and form galaxies. Conversely, if the universe is expanding slowly, it is easier for structures like galaxies to form. In effect, there?s a direct link between the history of structure formation in the universe, and the history of the universe?s expansion. The challenge in confirming the existence of dark matter and its effect on expansion is that most of the matter in the universe is dark and does not emit light. It cannot be detected directly by telescopes, which are light-collecting machines. One technique that can overcome this challenge is the detection and analysis of "weak lensing". A concentration of dark matter acts as a lens that bends light coming from even more distant objects. By analyzing how that background light is bent and how the lensing distorts the shapes of the background objects, it?s possible to determine how dark matter is distributed in the foreground. This analysis of dark matter and its effects lets astronomers determine how it has assembled over time. The assembly history of dark matter can be related to the expansion history of the universe, and should reveal some of the physical properties of dark energy, its strength and how it has changed over time. To get a sufficient amount of data, astronomers need to observe galaxies more than a billion light-years away, across an area greater than a thousand square degrees (about one fortieth of the entire sky). The combination of the Subaru telescope, with its 8.2-meter diameter aperture, and Suprime-Cam, Hyper Suprime-Cam?s predecessor, with a field of view of a tenth of a square degree (comparable to the size of the Moon), has been one of the most successful tools in the search of faint distant objects over a wide area of sky. However, even for this powerful combo, surveying a thousand degrees of sky at the necessary depth isn not realistic. "This is why we spent 10 years to develop Hyper Suprime-Cam, a camera with the same of better image quality as Suprime-Cam, but with a field of view over seven times larger," said Dr. Satoshi Miyazaki. Hyper Suprime-Cam was installed on the Subaru Telescope in 2012. Following test observations, it was made available for open use by the astronomy community in March 2014. A "strategic" observing program, consisting of more than 300 nights of observing over five years is also underway. The camera, with 870 million pixels, delivers images that cover an area of sky as large as nine full moons in a single exposure, with extremely little distortion, at a fine resolution of seven thousandths of a degree (0.5 arc seconds). Researchers from NAOJ, the University of Tokyo, and collaborators analyzed test data from Hyper Suprime-Cam?s commissioning to see how well it could map dark matter using the weak lensing technique. The data from a two-hour exposure covering 2.3 square degrees revealed crisp images of numerous galaxies. By measuring their individual shapes, the team created a map of the dark matter hiding in the foreground. The result was the discovery of nine clumps of dark matter, each weighing as much a galaxy cluster. 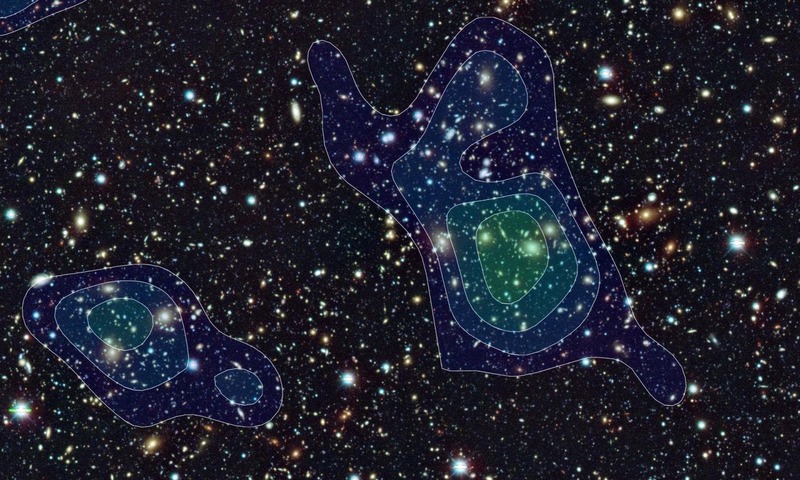 The reliability of the weak lensing analysis, and the resulting dark matter maps, have been confirmed by observations with other telescopes that show actual galaxy clusters corresponding to the dark matter clumps discovered by Hyper Suprime-Cam. They utilized the archived Deep Lens Survey (PI: Tony Tyson, LSST Chief Scientist) data for the optical cluster identification. The number of galaxy clusters by Hyper Suprime-Cam exceeds predictions from current models of the universe?s early history. As the research team expands the dark matter map to their goal of a thousand square degrees, the data should reveal whether this excess is real or just a statistical fluke. If the excess is real, it suggests that there wasn?t as much dark energy as expected in the past, which allows the universe to expand gently and stars and galaxies to form quickly. Using weak lensing to map dark matter map is a way to discover astronomical objects using their mass, to learn that something exists and how much it weighs at the same time. It gives a direct measurement of mass that is typically unavailable when using other methods of discovery (Note 2). Therefore, mass maps of dark matter are an essential tool for understanding the expansion history of the universe precisely and accurately. These are the first scientific results from Hyper Suprime-Cam and were accepted for publication in the July 1, 2015 edition of the Astrophysical Journal.